The Nats are getting into a groove. And, thanks to the Phillies and Cubs, the Nats regained sole possession of first place after sweeping the Houston Astros in 2 games. This was a big turning point, and now the Nats get ready for a huge 4 game set against big rivals the Atlanta Braves. The Nats have been playing solid baseball lately. They took 2 out of 3 in San Diego with 2 shutouts, took 3 out of 4 to the Giants, who at the time had the best record in baseball, and swept the Astros. Even though the Nats were swept in St. Louis, they were solidly in those games too. 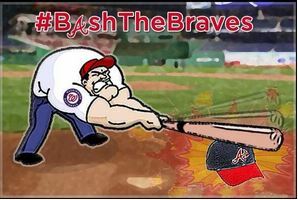 But the team the Nats has struggled the most against is the Braves, a team they have gone 1-5 on this year. Remember, though, that key offensive piece Ryan Zimmerman was hurt during their last series in the Peach State. The Braves have been in a downswing and were last swept by the Phillies. After their latest loss, Braves catcher Ryan Doumit said “We didn’t play our best this series, but we seem to crank it up a notch against the Nationals, and I expect us to do so. ” These words spoke might put a shudder in to Nats fans, but Mike Minor and Ervin Santana have been just stinking it up the past few starts. They will both start this series. I am predicting the Nats will edge out 3 out of 4. Julio Teheran is facing Doug Fister on Saturday Night FOX baseball, and that’s the one I think the Nats will lose. I’m guessing JZ beats Gavin Floyd tonight, Stras beats Minor in almost every category, and Roark has pitched quality baseball lately. He’ll face Ervin Santana. So with my fingers crossed and no jinxes, my prediction is that the Nats can (gulp) very well (gulp) take this series.